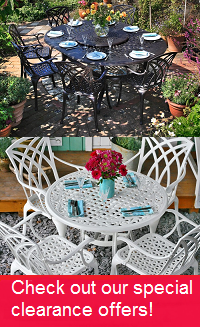 Get fantastic offers on a wide range of our clearance garden furniture. All items in clearance are from our regular ranges but at greatly reduced prices. These deals will not be repeated. Sometimes we put end of line pieces into clearance, and occasionally overstocked products. So if there's something you’ve had your eye on for a while, it is worth checking our garden furniture clearance section regularly. From time to time we have items of furniture that are a little less than perfect – a scratch here, a scuff there, but they are still perfectly usable. Occasionally a table or chair has a small irregularity, and although it passes quality control, we won't sell it at full-price. Perhaps they’ve been on display in our showroom in Chichester and are showing a bit of wear and tear. These items also end up in clearance. If you are interested in a piece of furniture in this section, click on it and read the product description to learn more about it. This is a very popular section of our site, with some fantastic bargains to be had, so items tend to sell out fast. If you see something you like – act now to avoid disappointment.